“I’ve tried everything. Why Am I Still Fat?? 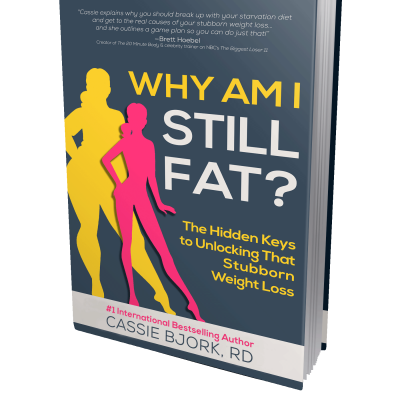 ?” This is the question coaching clients ask when they begin their journey with me and my team of dietitians. In my #1 bestselling book, I reveal the fourteen never-talked-about keys no one has told you about. These are the keys that really unlock your metabolism's true power. I outline the perfect program for rebooting your metabolism and losing weight—all while eating more food than you've ever eaten on any diet. This may be the first time a dietitian tells you that weight loss isn’t just about food and exercise! This new approach will free you forever from a vicious cycle of endless dieting. Grab your copy of my bestselling book by clicking the pink button below! If you live outside of the United States, get your copy of the book here! 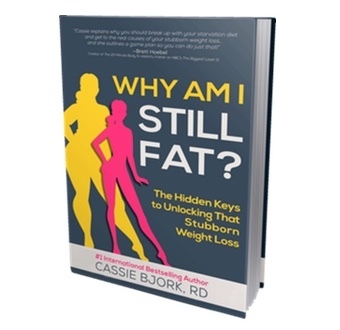 "Cassie isn't here for some quick fix, fad diet. This is not another hopeless remedy. She really cares to help people and shows us that though our food system may be screwed up, it isn't impossible. I have never felt so much freedom in my life than I have now! Cassie shows you HOW without deprivation or feeling overwhelmed, but also going deep and getting to the bottom of the cause — so much deeper than just food. This life-transforming message and truth needs to be in everyone's hands!"